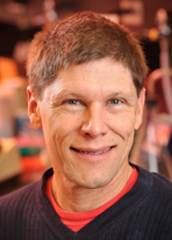 Mark R. Walter, Professor of Microbiology, received his Ph.D. from UAB in Biochemistry in 1989 with Dr. Steve Ealick. Following his Ph.D., Dr. Walter completed postdoctoral studies with Dr. Charles Bugg a pioneer in the area of structure-based drug design, where he initiated research in cytokine structure and function. He was awarded a Presidential Early Career Award in 1996 for his structural analysis of IL-10 and interferon gamma. Dr. Walter is currently Chairman of the Purdue Cancer Center Advisory Board and consults with Companies interested cytokine therapeutics. His outside interests include backpacking, cycling, water and snow skiing. A major focus of the lab is elucidating crystal structures of cytokines bound to their cell surface receptors. These studies provide the framework for detailed biochemical and cellular characterization of how cytokines assemble a “signaling competent” complex leading to cellular activation. The goal of these studies is to extend our understanding of basic signaling mechanisms. These findings are then applied to complex problems in human disease. We are currently using what we have learned to understand interferon signaling in lupus, and designing novel vaccine strategies to prevent human cytomegalovirus (HCMV) infection, which is responsible for serious birth defects in children whose mothers are infected while pregnant.